Computer guided implant surgery represents a giant step forward in the replacement of teeth with dental implants. 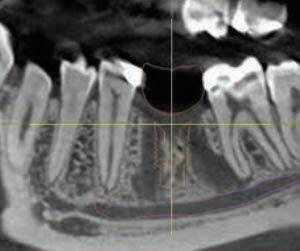 Using Computerized Tomography (CT) Scan techniques and 3-D imaging, we can now visualize the placement of dental implants in three dimensions. This eliminates the guesswork involved determining what parts of the jawbone offer the best sites for dental implant placement. It also allows us to create the permanent restoration prior to surgery and place the restoration the day of the surgery. 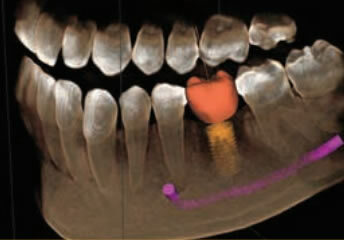 Computer guided implant surgery provides greater patient satisfaction and simplifies the dental implant treatment process. This revolutionary system offers a more accurate and safer positioning of dental implants. This technology enables us to get an advanced, detailed look at the interior sections of the jaw bone, surrounding tissue and the nerves. These CT scan machines are the same as those used to aid surgeons in joint replacement procedures.